One key to consistent business growth and an inexpensive way to get more revenue, is to increase the value of the customers already existing in a business. It is important for business owners and their teams to view customers as in terms of a lifetime value - the dollar amount they will generate over the long-term, instead of just a once-off transaction. The mindset begins with looking at the business as a total marketing entity, rather than just a production, service or retail entity. This allows the ability to visualize all marketing expenses as investments that generate return. This will also help to accept the reality that attracting a new customer is the biggest but most profitable expense if the business owners knows exactly how much to spend of marketing in order to generate revenue. Only when a customer’s lifetime value is realised, the importance of developing great relationships with existing customers becomes truly evident. But how do you get a customer to be loyal to the business? Make it easy and enjoyable for people to buy. Introduce a plan that goes beyond good customer service and exceed the customer’s expectations every time. Through coaching Bruce works with startup businesses, business owners, entrepreneurs and everything in between on how they can grow their business by encouraging existing customers to return, thus reducing customer turnover and turning current customers into a company’s most prized asset, Raving Fans. If you would like more advice or ideas on how to improve repeat business or customer loyalty in your business, get in touch with us today. 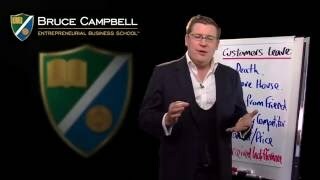 I am often reminded of getting back to basics to build revenues and profits in business. Much has been written in recent years about the WOW factor, that unique aspect of certain businesses with service that overwhelmingly surprises customers by continually exceeding their expectations.